Importantly, federal pre-emption has been exaggerated. Local governments do have authority to impose procedural requirements for example. Please consider these two useful documents that came out of the efforts in Montgomery County Maryland by the law office of Mark C. Del Bianco and which clarify what localities can and cannot do in terms of procedural requirements for companies. See more resources on 5G – including the research in health effects and impacts to people, trees and wildlife here. Wireless radiation has harmful biological effects levels far below government limits. Aesthetic, design, and noise requirements such as colocation, camouflage, height and light limits, etc. Note: These were compiled from EHT research of various sources and a special thank you to Physicians for Safe Technology, My Streets My Choice and Last Tree Laws for their extensive resources utilized on this page. Please be sure to go to these pages for more information. Please contact EHT to add your Cities information to this page. Antennas must connect to an already existing utility pole that can support its weight. Servicing wires must be installed within the width of the existing utility. All ground-mounted equipment not to be installed inside the pole must be undergrounded, flush to the ground, within three (3) feet of the utility pole. Dedicated power source to be installed and metered separately. 1,500 feet minimum between each Small Cell facility. No Small Cell shall be within 200 feet of any residence. An encroachment permit must be obtained for any work in the right-of-way. City to study citywide fiberoptic cable network. Small Cell Committee drafted policy with annual recertification fees. Verizon withdrew its application, concerned by the precedent it would set and questioning its legality. The Town of Burlington Policy / Application for Small Cell Wireless Installations approved by the Burlington Board of Selectmen on October 22, 2018 PDF. “This week Selectman Jim Tigges, the board’s representative on the Small Cells Committee, said the group had come up with a new policy for small cell applications. The policy contains a number of provisions while filing an application, including setting installation fees, listing the town department that must receive a copy for review and setting up the timeline for approval. – Equipment shall be located on top of the poles, colored similarly to the polse so as to blend in. – Equipment shall not interfere with other equipment on the pole, nor obstruct or interfere with access to or operation of street lights or traffic controls devices on the pole. New or updated facilities prohibited in residential zones. Commercial only. Adopted regulations prohibit facilities in residential and downtown zoning district. Facilities proposed in the public right-of-way subject to separate design criteria. Limits height and width of facilities to a minimum necessary for property function. Maximum height of 24 feet above the height of the existing utility pole and 7 feet above a street light standard. Requires equipment to be placed underground. Utilities must be underground to extent feasible. “Meters, panels, disconnect switches and other associated improvements must be placed in inconspicuous locations to the extent possible”. To see the code online go to https://qcode.us/codes/walnut/, Click on “Title 6: Planning and Zoning” Click on “Chapter 6.88 ANTENNAS AND COMMUNICATION FACILITIES”, Click on “6.88.060 Design standards, See Item “O. 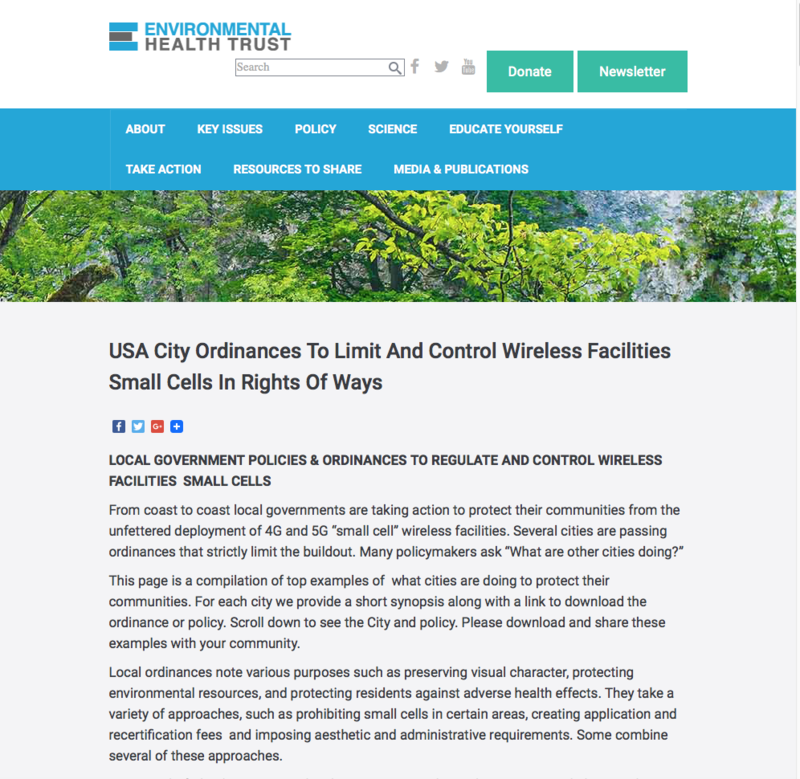 Requires a special use permit for cell towers that encourages location of new wireless facilities so as to minimize their impact on historically sensitive areas around residences, schools, houses of worship, day-care centers. Seven consideration factors are listed in order from more to least preferred, with existing towers being most preferred and new towers in residential zones least preferred. On Nov 5, 2018 Sonoma approved their 5G urgency ordinance. The City also has a Small Cell Tower page. This document also reviews other Cities 5G small cell policies. Public Utility Commission stripped Mobilitie and other distributed-antenna companies of utility status, meaning that they would not get any more “certificates of public convenience” in Pennsylvania. Holyoke has submitted an order from councilor Bartley Roman to limit equipment and require $500 apiece per small cell–$500 may exceed FCC limits. At-large councilor Rebecca Lisi, on behalf of a Holyoke resident, recently submitted to the town lawyer a copy of the ordinance drafted by Pittsfield. Note: These were compiled from EHT research of various sources and a special thank you to Physicians for Safe Technology, My Streets My Choice and Last Tree Laws for their extensive resources. Please contact EHT to add your Cities information. Other Important Websites on 5G and Small Cells.